PC Power & Cooling seems to believe the more the better so they have just introduced a new PSU that can continuously deliver 1000W with peaks of maximum 1100 watt and juicy 66A 12V lines. These power supplies fit in standard ATX cases and the manufacturer claims they run quietly. "In order to generate one kilowatt of continuous power from the existing 850 SSI platform, the Turbo-Cool 1KW's power modules were engineered for greater thermal efficiency and key components throughout the unit were upgraded to handle the additional current. 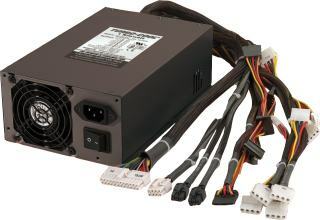 The result is an EPS12V/SSI/SLI power supply with unprecedented output (66 amps total on the +12VDC rails) in a form factor that fits most ATX cases." The Turbo-Cool 1000W PSU will ship for a very high price tag, it will retail for $489, but will have a 5-year warranty. Personally I think this is just overkill. There's no desktop system on the market that even needs anywhere close to 1kW of power and most people have more than enough with a 400W PSU. Even for the future 1000W is still overkill as the overall tendency seems to be to lower the power consumption of computer systems.